Home Blog Can You Praise God for Your Capacity to Suffer? Can You Praise God for Your Capacity to Suffer? Growing up in the Catholic faith, I’ve been taught to offer my suffering up for others who struggle more than I do. It’s difficult for me to be patient with suffering. It’s not the suffering itself I resent, but rather the fact that it takes me away from what I want to be doing, when and how I want to do it. It’s an accomplishment mentality, you might say. I don’t mind “offering up” for others as long as I can accomplish what’s on my personal to-do list – or the list my editors, publishers, and clients have given me. Sometimes that works. Sometimes it doesn’t. I’m learning that I can’t always grit my teeth and power through suffering. Sometimes suffering stops me in my tracks (or at least significantly slows me down). Those are the times I find it much, much harder to tolerate suffering, much less offer it up. 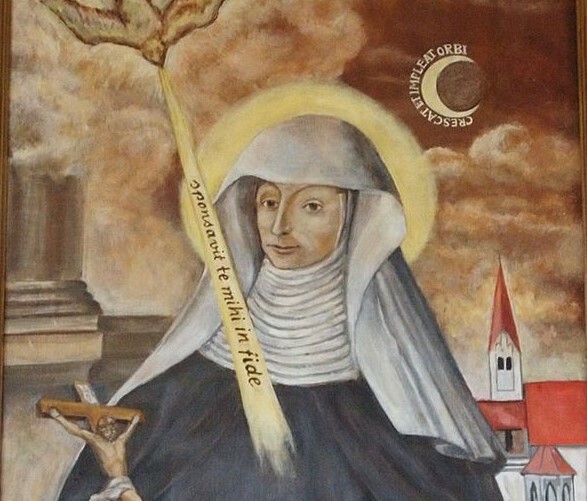 St. Crescentia was born in 1682 near Augsburg, Germany. her father was a weaver, and her family was terribly poor. As a child, she was devoted to prayer and to caring for those who were even poorer than she was. Because of her aptitude for the Catholic faith, she was given special permission to receive her First Holy Communion at the age of seven, which was quite early for that time period. As a young woman, Crescentia desired to enter the Tertiaties of St. Francis. The convent denied her admission because it was a poor convent and Crescentia didn’t have a dowry. With some finagling by the town’s mayor (the convent owed him a big favor), the young woman finally was accepted into the community. Sadly, the community felt coerced into the deal, and the nuns made her life miserable. She was given the “dirty work” and ridiculed for her cheerful demeanor. Four years later the convent received a new superior. This one understood Crescentia, and saw the potential for holiness in her. Soon she was appointed mistress of novices. When the superior passed away, Crescentia was unanimously elected to replace her. Under Crescnetia’s direction, the convent’s conditions improved and the saint gained a reputation for wisdom in spiritual matters that drew even royalty and Church hierarchy to ask her counsel. Still, she remained the humble maiden she’d always been. Crescentia suffered physically her whole life, with headaches, toothaches, other terrible pain and various afflictions. Eventually, she was no longer able to walk. Her hands and feet crippled to the point of being useless and her body crumpled into a fetal position. When I read about Crescnetia’s response to her suffering, it blew me away. Amid her suffering, she remained peaceful and joyful. What’s more, she not only accepted it, not only offered it up, but she embraced her Franciscan heritage and turned her suffering into a song of praise to God. It’s one thing to be thankful for suffering because you can offer it up for the sake of others – people you love, souls in purgatory, or persecuted Christians, for example. It’s another to see your suffering, and in particular, the parts of you that are suffering, as instruments in praising God and to be truly grateful for their capacity to suffer. Just think about it. If we did not have the ability to feel pain – whether emotional, spiritual, mental, or physical – we would be numb creatures with no sensitivity for ourselves or others. We would be empty and unable to understand or feel our dependency on God. Our capacity to suffer it a gift in and of itself. The fact that we can suffer means we’re alive, human, responsive, organic, and like God’s beloved Son who became human out of love for us. Oh, you bodily members, praise God that he has given you the capacity to suffer. It might take a while to sink in – I’ve got a long way to go before I reach sanctity – but eventually, by the grace of God, I’ll get there. Crescentia died on Easter Sunday, 1744 and was canonized by St. Pope John Paul II in 2001. You can listen to St. Crescnetia’s story from Franciscan Media here. Catholic Church, Saint of the Day, suffering. Bookmark. Pope Francis’ ‘Amoris Laetitia’ is Out!